This News Bulletin describes three separate killing incidents, where five people in total were killed based on witchcraft suspicion, in Hpa-an District in Paingkyon Township, between April and September 2016. On April 9th 2016, at night time, Naw A---’s husband was arbitrarily arrested and killed by a group of villagers when he and his youngest son returned home from watching a movie at another villager’s house in B--- village, Paingkyon Township, Hpa-an District. In August 2016, a husband and wife of G--- villagers were shot and killed in two separated locations at the same night at 9 PM in G--- village. In September 2016 at 3 AM in the morning, Naw L---’s family was attacked by a group of people with armes leading to the shooting and killing of Naw L---’s mother, Ma P---, 87 years old, and her brother Maung N---, 48 years old in M--- village. The raiders also robbed 3,500,000 kyat [US$2567.81]and precious properties that belonged to Naw L---’s family. All three killing cases were committed by villagers who claimed that the murdered people were practicing witchcraft. In some cases, perpetrators were linked to an armed group. On September 25th 2016, a KHRG community member met and interviewed a 40 year old female B--- villager, named Naw A---, who reported about how her husband was killed by a group of villagers because villagers suspected him of practicing witchcraft. 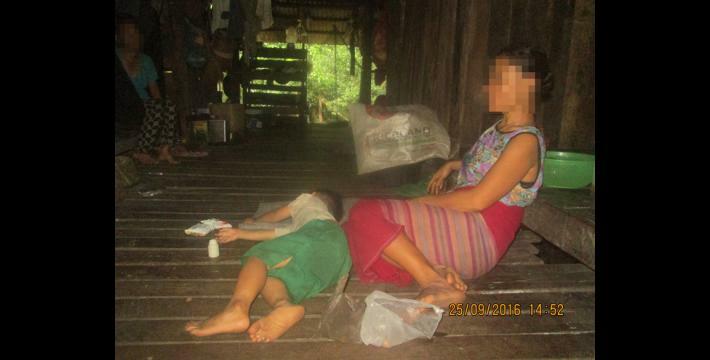 Naw A--- reported to a KHRG community member that on April 9th 2016, at night time, her husband Saw C--- was arrested and killed by a group of villagers when he and his youngest son were returning home from watching a movie at another villager’s house in B--- village, Paingkyon Township, Hpa-an District. According to Naw A---, the villagers who killed her husband did so because they suspected that he had buried cursed items including red seeds, cremation charcoal, a voodoo doll and/or stones with curses on them under other villagers’ houses. After her husband was killed, other villagers also told her that her husband used to tell them that he was immune to arrest and killing because he could do witchcraft. She was also told by villagers that he had killed almost a hundred of people in his original village with his witchcraft skills. Villagers who had argued with her husband prior to her husband’s murder further told her that her husband could do witchcraft and when social conflict occurred in the village they suspected that her husband did it with his witchcraft skills. “People said, “He could do witchcraft, so his wife can do it too. Her husband would have taught her [how to do witchcraft].” They spoke in secret and said if anything happens [in court] and if I report this [that they killed my husband] to someone [the authorities], then they would kill all [of my family members], and they would not leave anyone left.” Naw A--- still does not know and has not been told where her husband’s body has been left. Furthermore, after her husband was killed, she has faced livelihood difficulties because she had always relied on him for the family’s livelihood, as he had worked on a plantation to provide money for them. Naw A--- now has to work on the plantation on her own which she finds difficult because she says she has a lack of understanding and skill relating to plantation work. Naw A--- is left with livelihood pressures to support her two youngest children who stay with her, whilst her eldest son has migrated for work in Bangkok, Thailand. In October 2016, local authorities including the KNU, held a meeting with Naw A--- and relevant villagers and discussed the case. It was decided that no action should be taken as it might cause further trouble and harm to the remaining victim’s family members. 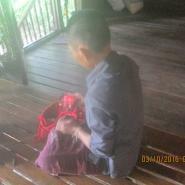 According to a KHRG community member, when the case reached the KNU’s Paingkyon Township office, the KNU’s township administrator along with other KNU officials went to the area and held a meeting with village leaders, Naw A---, the victim’s older brother and relatives, and villagers including perpetrators. In the meeting, villagers admitted that they were all included in the plan and killing of Naw A---’s husband. After some discussion, all villagers agreed that they would provide financial support for Naw A---’s husband’s funeral, help build a house for Naw A--- and her children, and support two of Naw A--- ’s younger sons, the youngest who is currently five years old, in their education until they are 18 years old. As many villagers were involved in the murder the KNU decided it could not take criminal action against all perpetrators. However, in the meeting Paingkyon Township’s KNU administrator asked all villagers who were present to sign an agreement that stated that villagers must not commit any [further] crimes against people said to be practising witchcraft, and this agreement is to be kept at the township office .The victims’ family members and relatives agreed with the decision that KNU officials had made for them. On September 18th 2016, in a separate incident, a KHRG community member met with a female health worker and interviewed her about a killing case that had happened in August 2016 in G--- village, T’Moh Klo village tract, Paingkyon Township, Hpa-an District. In August 2016, a husband and wife in G--- village were shot and killed in two separate locations on the same night, at 9 PM in G--- village. The husband was shot and killed at his farm hut, whilst at the same time his wife was taken from her house and was shot and killed in front of the village primary school. Both husband and wife were killed by machine gun. According to the villagers, the couple was suspected of practicing witchcraft. It is believed they were killed by Border Guard Force (BGF)’s soldiers under General Hpah Nwee’s command, also known as Hpuh Hpah Nwee. Less than one year prior to the incident, the couple and their family members had been asked to drink promissory water at BGF’s General Hpah Nwee’s place and the couple had been told by General Hpah Nwee not to practice witchcraft anymore. However, the couple was killed less than a year after they drank promissory water. According to local sources, the people who killed the couple asked the G--- village head to bury the dead bodies. The perpetrators also told the victims’ remaining family members, victims’ relatives and other villagers not to report the killing case and threated to kill all family members if they report the case and if news of the killing case were to spread. The husband and wife who were killed had three children; the eldest child migrated to work in Thailand, the middle child stays in a monastery in town and the youngest child who is five years old stayed with them to attend school. As of September 2016, the two older children were not informed that their parents had been killed, whilst the youngest child was in the care of her 75 year old grandmother who cannot work for her living, and other family members stay nearby to provide additional help. Furthermore, as the woman was shot and killed directly outside the village school, at the time of reporting, teachers and students did not feel safe to teach and study at school anymore. Instead, they were teaching from a villager’s house. There has been no action from authorities for this case as the family report that they are fearful to report it to authorities. 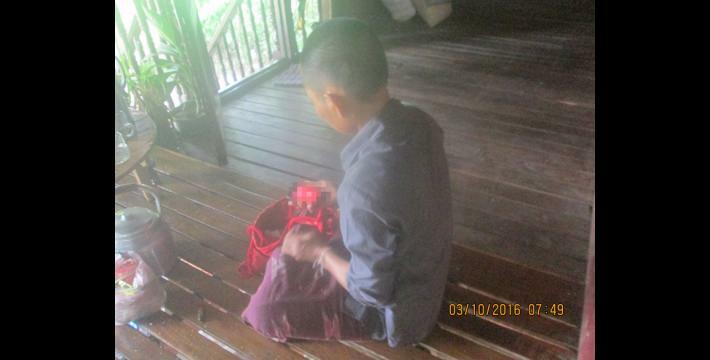 On October 3rd 2016, in a separate incident, a KHRG community member met and interviewed a 43 year old woman named Naw L--- in M--- village, Paingkyon Township, Hpa-an District. Naw L--- reported to a KHRG community member about the killing incident of her mother and her brother during a robbery that happened in September 2016, both of whom were accused by local people of practising witchcraft. “The killers took my axe and my knife. They hacked my head with the axe that I used to cut firewood [...]. How many times did they fire the gun? Naw L--- mother’s name was Ma P---, she was 87 years old. Her brother’s name was Maung N---, he was 48 years old. The group of people who raided the house and killed them reportedly included KNU-KNLA PC soldiers. According to Naw L---, prior to the incident, she went to Thaton Town in April 2016 to check with a Burmese-speaking spirit healer (shaman) about the witchcraft allegations, by asking the healer whether her mother had witchcraft skills or not. The spirit healer checked and told Naw L--- that her grandparents had been able to do witchcraft, and that they had passed this skill to Naw L---’s mother before they had died. Following this, Naw L--- returned to her village and her mother, her brother and herself went to another spirit healer in S--- village to rid themselves of the witchcraft that they were suspected of. The spirit healer did not see any evil spirits in Naw L--- and her mother but the fortune teller explained that Naw L---’s brother had taken a ball of thread from dead people [their bodies] and, because of this, the evil spirit was close to him. Therefore, the spirit healer asked them to stay for three days for the treatment before returning back to their village. Before Naw L--- returned to her village, she requested the spirit healer to go to her house and check around their compound for any evil spirits, and to check if anyone had buried anything evil (items that had been cursed/possessed) under their house. Sometime after Naw L--- returned to her village, the spirit healer phoned Naw L--- and asked her to invite her village leaders to her house, and told her that he would come there and solve the issue of the evil spirits. According to Naw L---, when the spirit healer came to her house to take away the evil spirits, some villagers were not satisfied with the action, and they continued to accuse Naw L---’s mother of having witchcraft skills and of having a stone possessed by evil spirits, although Naw L--- asked the spirit healer to check the gem stones that they owned, and he stated that they were good stones, not cursed. Following this however, the spirit healer asked Naw L---, Naw L---’s mother and Naw L---’s brother to drink promissory water in front of village leaders, villagers and the Paingkyon Township KNU’s official to prove that Naw L---’s family were not practicing witchcraft. According to local belief, upon drinking the promissory water, if any of the family members were practicing witchcraft they would experience bad effects or die brutally. Nothing happened to Naw L---’s family after they had drunk the promissory water until the night of the attack on their family home. According to Naw L---, the group which shot and killed her mother and brother also took 3,500,000 kyat [US$2567.81] from her house, and stole additional precious gold items which were four rings, four necklaces, one pendant, one piece of hair clip, a piece of golden comb, a piece of golden bangle, and a dozen golden buttons. Naw L--- did not know the value of the gold that the group stole because she had never weighed the gold. In the morning after the robbery and killing of Naw L---’s mother and brother, the Myanmar police came to the village and went to the incident place, Naw L---’s house, and examined the crime scene. The police asked Naw L--- many questions about the incident. Due to the injury that Naw L--- sustained on her head from the axe attack, Naw L--- was then sent to Paingkyon hospital and then to Hlaingbwe hospital. However, neither of the two hospitals accepted her for treatment as they were not equipped with an X-ray machine and deemed her injury as too serious. Finally, Myanmar police sent her to Hpa-an Hospital where she received treatment. However, despite her serious head injury, Naw L--- stayed at Hpa-an Hospital for only one day before requesting permission to return to her home village in order to attend her mother’s funeral service, and to receive treatment at a local hospital in her village area. Naw L--- did not remember the exact incident date but she told a KHRG community member that the incident had happened less than a month before her meeting with KHRG community member on October 3rd 2016. According to the local source, as of March 2017, Paingkyon Township KNU’s leaders held the meeting with village tract leaders and Naw L--- in order to address a complaint raised locally that village tract leaders had been involved in the decision to kill the two family members. During the meeting, village tract leaders denied the accusation that they had been involved, and reported that they had not been aware of the plan to commit this crime. Additionally, Naw L--- reported that the Myanmar police had found all the property stolen from her and had promised to return it but Naw L--- had not received any back yet. These photos were taken on October 3rd 2016 in R--- village, K’Kyoh village tract, Paingkyon Township, Hpa-an District. 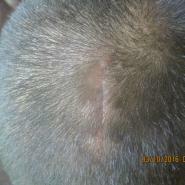 The photo shows Naw L---, who was hacked on her head by an axe when a group of people attacked her family at 3AM in the morning in their family home. 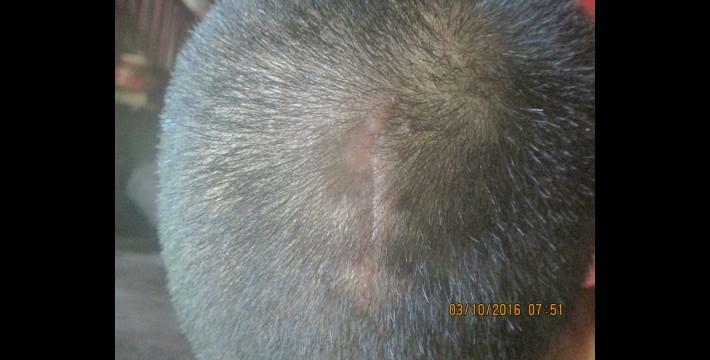 Naw L--- received stiches to her head for her injury. Naw L---’s mother and brother were shot and killed during the attack and the suspects also took 3,500,000 kyat [US$2567.81] and other precious items including golden necklaces and rings that belonged to Naw L---’s mother. Naw L--- reported that her mother and brother were rumoured to have witchcraft skills and she thinks the murders were organised by some local people including KNU/KNLA-PC soldiers because of this. [Photos: KHRG]. This News Bulletin was written by KHRG office staff and is based on information from a community member from Hpa-an District who has been trained by KHRG to monitor local human rights conditions. It summarises information from three interviews received by KHRG in November 2016. In order to increase the transparency of KHRG methodology and more directly communicate the experiences and perspectives of villagers in southeast Burma/Myanmar, KHRG aims to make all field information received available on the KHRG website once it has been processed and translated, subject only to security considerations. For additional reports categorised by Type, Issue, Location and Year, please see the Related Readings component following each report on KHRG’s website. For the full interview with Naw A, see, “Hpa-an Interview: Naw A---, September 2016,” KHRG, July 2017. All conversion estimates for the kyat in this report are based on the 7th July 2017 official market rate of 1363 kyat to US $1.